Andzejs Pjateckis, CEO at MEGOGO in the Baltic region, points out that the service has collected enough content to launch a separate channel for 3D video fans. “We have many blockbusters, thrillers, dynamic action movies, drama and cartoons that have been recently shown in cinema. We also added a great amount of TV shows. The channel is designed for fans of modern technology, somebody who appreciates a first-class thrill and unforgettable experience”, – says Andzejs Pjateckis. 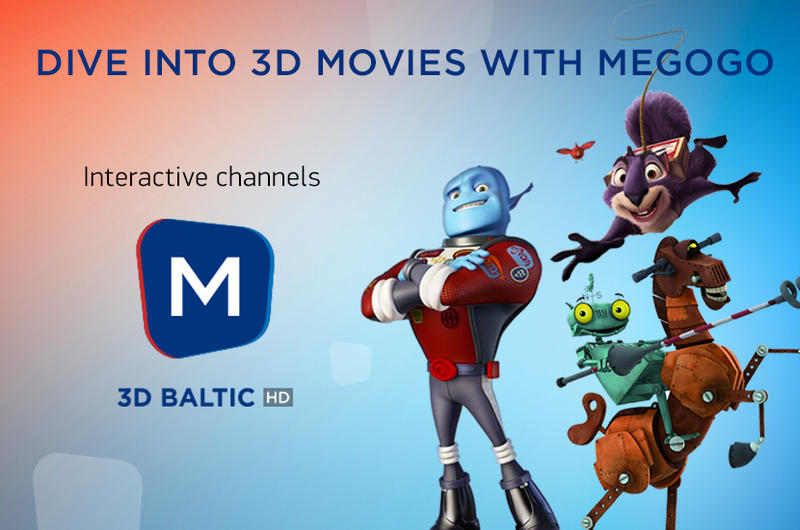 It’s already the 16th interactive channel for the MEGOGO users in the Baltic region. Among others MEGOGO offers [M]Cinema Hit HD,[M]Comedy HD,[M] Kids HD, [M] Romantic Drama HD,[M] Horrors HD, The Harmony of Classics HD,[M] Golden fund, etc. In order to view the channels you have to subscribe to “Movies and TV”. The first months is “try&buy”, for only 0,19 Euro. It’s worth mentioning that interactive channels MEGOGO are playlists of VOD content, but they look like regular TV channels. You can watch, pause and rewind any movie or TV show available in the list of programs right away.